It is now crystal clear that the politicians in Biafra Land no longer have the mandate of the people as regards to the Nigerian politics. Since the creation of Nigeria by the British, politicians from the region known as Eastern region have not had a fair share in the Nigerian political space because all the political powers was handed down to the Hausa Fulani in the North by the colonial masters and has remained there even up till date. After the Nigeria/ Biafra civil war, all the politicians from Biafra extraction has been stampeded in to oblivion and can no longer find their voices in the Nigerian politics. The emergence of the leader of IPOB worldwide Mazi Nnamdi Kanu was a game changer in the political facets of the Nigerian state which was made possible by his illegal arrest and unlawful detention by the Nigerian government. It is pertinent to note that, during the unlawful incarceration of Mazi Nnamdi Kanu, most of these politicians have been criss-crossing Aso Rock the Nigeria seat of power not only for political gains but also for personal aggrandizement. These politicians from Biafra Land have continually failed in protecting the interest of the people they are representing in their various offices. In as much as they were elected into the office, they have the mandate to represent the people but have failed woefully by neglecting the core reasons they were elected. 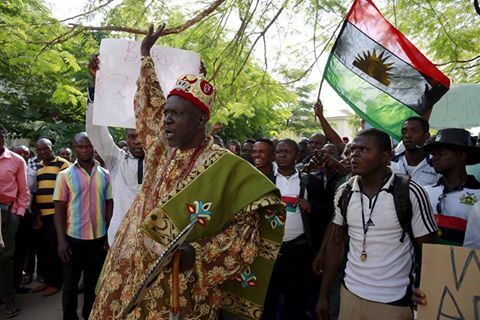 IPOB has maintained and proven to the world that power belongs to the people of Biafra and the people have decided to take back their land at all cost, even as they have openly withdrawn their support from the politicians representing them in the Nigerian affair as a result of gross misrepresentation that have led to the continued marginalization, economic strangulation and unimpeded infrastructural decay that have drastically bedevilled the Biafran territories. However, 30th May 2017, is a day set aside by IPOB to remember our fallen heroes, those that paid the ultimate price that we may have freedom from the British business hub called Nigeria. Those that defended our motherland with their lives both during the war and in recent times; We must honour them. Therefore, politicians from Biafra extraction should as a matter of decency and respect for the dead queue themselves behind Nnamdi Kanu the supreme leader of IPOB worldwide, by encouraging and obeying the SIT AT HOME order from IPOB leadership. It will be a grave mistake and suicidal should they overhaul and go against this order which is geared towards honouring our dead. It will also be to their own peril should they jettison this clarion call that will eventually send an unmistakable and unprecedented signal to the Nigerian government and the international communities that the people of Biafra are set to go home. Of a truth, the Biafra and Nnamdi Kanu's factor have reduced the popularity formerly enjoyed by these politicians as a result of their inept and corrupt practices that have ravaged the system beyond repair. Nnamdi Kanu through his thunderous voice on Radio Biafra London has harmonised the Biafran people and as well emancipated them from mental slavery orchestrated by the British/Nigeria. Nnamdi Kanu has proved to the world that he has the qualities and abilities with the mandate and unflinching support of Biafrans, to spearhead the Biafra restoration project, of which these politicians do not have. Therefore, these politicians should not underrate or underestimate the rising popularity of Biafra restoration and Nnamdi Kanu by not heeding to this call for Biafrans in Biafra Land to SIT AT HOME because any form of parallel order or counter order from any Biafra politician is tantamount to sabotage and Biafrans will as a matter of sanctity of Biafra restoration and respect to our fallen heroes, vehemently resist such and must put that politician(s) to where they belong. They should know that Nnamdi Kanu do not just command IPOB but commands Biafrans all over the world and this single order from him for Biafrans to SIT AT HOME must be carried out to the later irrespective of their political affiliation. It is now time for politicians from Biafra extraction to rise and fully support Mazi Nnamdi Kanu on this divine mandate by completely adhering to the SIT AT HOME order because Biafra remains a progressive platform for all Biafrans to excel in all aspect of life when restored. I therefore implore the politicians from Biafra extraction to take this opportunity to make a history for themselves by joining the SIT AT HOME order in respect to our heroes past and for posterity sake. Biafra remains the hope of Africa and the Black race.